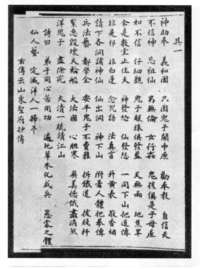 A Boxer Rebellion pamphlet, circa 1899, that refers to foreigners as guizi (鬼子) or yang guizi (洋鬼子). Anti-Japanese demonstrators in Taiwan hoist signs with "Guizi! Get out" (鬼子! 快滾) following an escalation in the Senkaku Islands dispute in 2012". Guizi (Chinese: 鬼子; pinyin: guǐzi) is a Chinese slang term for foreigners, and has a long history of being used as a racist and deprecating insult. Historically, Chinese people had the image of its borders continuously breached by "uncivilized tribes" given to mayhem and destruction. Within the southern parts of China, the term gweilo (鬼佬) was used and remains popular today, especially in the Cantonese speaking region of Hong Kong. In northern parts of China, the term "west ocean devil" (西洋鬼子 xiyáng guǐzi) was used, Europe being West of China. The term gui (鬼) in guizi (鬼子) is an adjective that can be used to express hate and deprecation, an example being the local's expression of their hatred towards the Japanese during their occupation of China in World War II with the same gui (鬼). It conveys a general bad and negative feeling and is a somewhat obsolete and archaic/old-fashioned term nowadays and other more modern terms have largely replaced gui (鬼) for similarly negative meanings. The character gui (鬼) itself can have negative connotations, even without the word zi (子), for example when it was attached to the Westerners in the term yang guizi (洋鬼子; lit. "Western devils") during Boxer Rebellion, Japanese military in the term guizi bing (鬼子兵; lit. "devil soldiers") during the Second Sino-Japanese War and the Korean military with the term er guizi (二鬼子; lit. "second devil"). However, the same term can also be applied derogatorily to any foreign military which was an enemy to China. In Taiwan, anti-Japanese demonstrators hoisted signs with "Guizi! Get out" (鬼子! 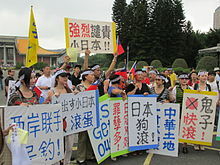 快滾) during the 2012 China anti-Japanese demonstrations. Riben guizi (Chinese: 日本鬼子; pinyin: rìběn guǐzi; literally: 'Japanese devil') or dongyang guizi (Chinese: 東洋鬼子; pinyin: dōngyáng guǐzi; literally: 'east ocean devil') – used to refer to Japanese. In 2010 Japanese internet users on 2channel created the fictional moe character Hinomoto Oniko (日本鬼子) which refers to the ethnic term, with Hinomoto Oniko being the Japanese kun'yomi reading of the Han characters "日本鬼子". Er guizi (Chinese: 二鬼子; pinyin: èr guǐzi; literally: 'second devil') – used to refer to Korean soldiers who were a part of the Japanese army during the Sino-Japanese war in World War II. Yang guizi (Chinese: 洋鬼子; pinyin: yáng guǐzi; literally: 'Western/overseas devil') or xiyang guizi (Chinese: 西洋鬼子; pinyin: xiyáng guǐzi; literally: 'west ocean devil') – used to refer to Westerners. Yingguo guizi (Chinese: 英國鬼子; pinyin: yīngguó guǐzi; literally: 'British devil') – used to refer to British. Faguo guizi (Chinese: 法國鬼子; pinyin: fǎguó guǐzi; literally: 'French devil') (French : Démons français) - used to refer to French who invaded China and Indochina. Look up 鬼子 or guizi in Wiktionary, the free dictionary. ^ a b "台湾民间团体发起保钓游行". Voice of America. September 23, 2012. Retrieved 2012-09-28. ^ a b Lafayette De Mente, Boyé (2000). The Chinese Have a Word for It: The Complete Guide to Chinese Thought and Culture. McGraw-Hill. p. 145. ISBN 978-0-658-01078-1. ^ "萌系日本鬼子 反攻中國". Liberty Times. November 1, 2010. Archived from the original on November 3, 2010. Retrieved 2012-09-29. This page was last edited on 30 September 2018, at 15:22 (UTC).